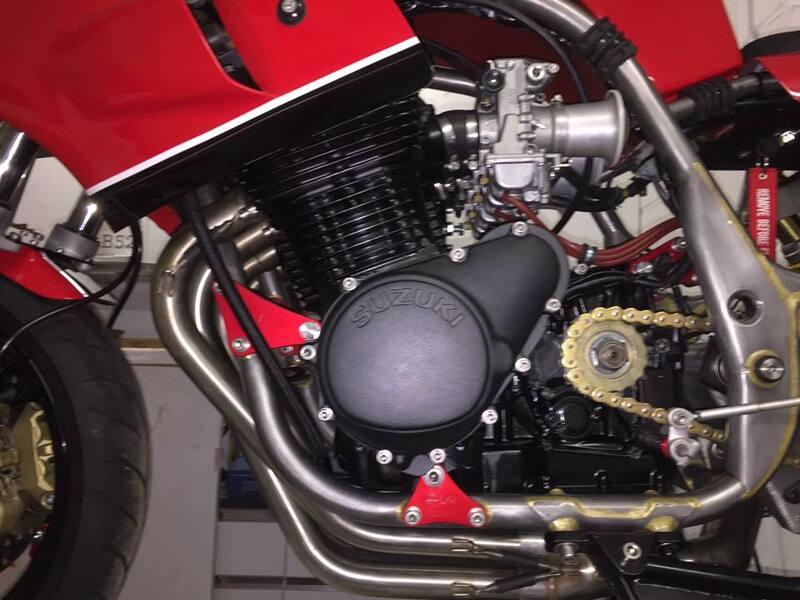 When Gary Bond built his Bike of the month Harris F1 as well as fabricating some of the billet aluminium trickery himself and having the other parts custom machined to his specification., he also anodised most of the parts himself. If you ever wanted to have a bash at this yourself, here’s how he did it. There is a gallery of pictures too. I’ve had a good few people ask me about the anodising process I used whilst building my Harris F1. No doubt I’ve missed out a few bits but I will edit it as I go. Its as follows…. OK, now that you have all your electrolytes, acids and rinses set up in their correct ratios and quantities, etc. You’re ready to start. Remember, the gasses given off when doing the anodising process are hydrogen gas. Its not harmful but it catches you in the throat, makes every steel part in your workshop rust and not to mention its highly explosive. Oh, and don’t get bleach near it either. Unless you want to meet your ancestors. Do your own homework on acids, gasses and poisons, etc. There are different finishes to anodising. I’ve done lots of practising and have come up with different results. You can use caustic soda to both strip off old or faded anodising prior to re doing the part. It also etches the part and it will give a very matt finish. If you want a clean shiny look, then don’t put the part into caustic soda. Or you can mirror polish the part prior to anodising. I have anodised some parts that have been machined. All that is needed is a good scrub with washing up liquid and a stiff pot washing type brush for a few minutes. Then into the nitric acid tank for a few minutes. If you leave it in for a long period, the acid eats away at the alloy and renders it scrap. Don’t ask me about that. From the moment you clean it, wear nitrile gloves. Any oil from yours hands will show up on the surface. You will see anodised fingerprint marks. You now need to wire up your part with the titanium wire. If the item is any bigger than say the size of a front sprocket, I always put 2 wires to the part. Its all down to the current carrying capacity of the wire. I’ve had the wires glowing red hot before now. Not ideal with hydrogen gas. If you can, wrap the wire round the part a couple of times as this makes for both a tighter bond between part and wire. Plus it gives you a better chance of electrical connectivity. I get around a 95% success rate now, but when I first started it was very much hit and miss. Work out the surface area of the part in inches. Say its a piece of alloy plate 5″ x 4″. That will give you 40 square inches. You now need to work out the amperage. You simply times the square area of the part by 0.16 amps. So the power pack needs to be set at 6.4 amps. My power pack only goes up to 10 amps, so I’m restricted as to how big the parts are. I generally turn my power pack up to max volts. I always put the power pack on for an hour. You need to put the sheet of lead into the electrolyte with the negative connection connected to it. I always use a steel tube to hang my wired bits from. Its this tube that you connect the positive to. If you have an extractor then I’d recommend using it. The part is the anode (hence where the word anodising cones from) and whilst it has a current passing through it, it actually grows bigger with the surface oxide. The surface oxide that has been grown takes up the look of a bee hive. The holes actually are hex shape and all interlock. The longer you leave the part cooking, the thicker the oxide becomes. Its the little hex like tubes that accept the dye and give the part its colour. You could simply just seal the part after the anodising process without using any dye. Dependant on the current, it can give you a colour of what almost looks like a titanium finish. I’ve cooked parts before and they’ve gone quite a brown colour. This is caused by too many amps being passed through. Right, so when you start the process, the part will start to fizz. I flick the tub in and out with my finger. This dissipates the bubbles that form on the surface of the part. Obviously, if the bubbles were left throughout the process the area under the bubbles wouldn’t be anodised as they’re not in the electrolyte. Its at this stage that I fill my large pot up with clean fresh tap water and put that on the stove to boil. This is what’s used to seal the part once its been in the dye. Its also good to heat the anodise dye too. But it only needs to be around luke warm. Nothing more is required. Once the part has been cooking for an hour, the power is switched off. The part is removed from the wire with cutters. Don’t forget to wear the gloves. I generally hang the part on a new bit of wire when dipping it into the dye. Once the dye is heated up, I tip it back into its plastic container. Some of the cheap handlebars, etc tend to fade. Its basically the quality of the dye that’s used. You could use either food or clothes dye too. But something like Sanodye is the way to go. Its UV stable and lasts. It gives you an excellent colour too. One thing to say is that not all aluminium alloys take to being anodised. And some come out a different shade to others too. So you need to experiment. I always dunk the part in clean tap water first to wash off any electrolyte. Then a quick dip into the distilled water tub before going into the dye. If you use a good quality dye and the process has worked as it should, the part will be through coloured within a minute of two. But I’ve had to leave the part for longer if the dye is cold. It makes a big difference. Once it comes out of the dye, it then needs to be sealed in the boiling water. Its better to hang it in the steam for a bit. Let the sealing process start to work before you drop it into the boiling water. Leave it in fir 5/10 minutes. When you lift the part out, chuck it into the tap water to cool it off. Then you can use normal car polish to polish it up. Gary has kindly offered to answer questions on his own experiences . Follow this link to a thread were you can do that.